As a child I always avoided dates; to me they looked a little like shrivelled cockroaches and I couldn’t understand why anyone would want to eat them. Now I can’t imagine ever refusing a delicious, sticky, sweet date. Both my boys have always loved dates but I do think stuffing them and adding some pretty topping makes them look a lot more appealing. I wonder if I had been offered stuffed dates as a child I would have been less repulsed! 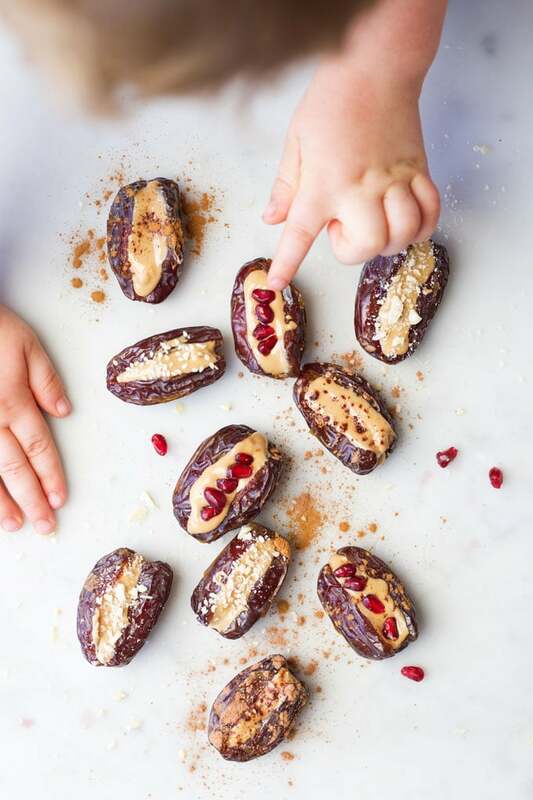 These stuffed dates were very popular in our house over this holiday season. I love that they are easy to prepare. They can be made in advance and can be enjoyed alone but are also perfect added to fruit platters or as part of a cheese platter. 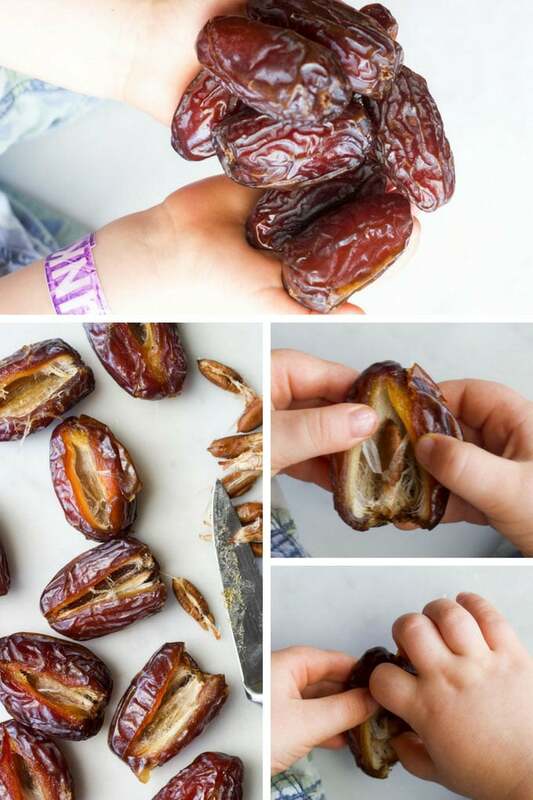 To remove the stone from fresh dates you can simply push them out with your fingers. When making stuffed dates I prefer to make a slit with a knife and then get the boys to remove the stones for me. Be careful when making the slit that you don’t cut the date in half; you just want to make a crevice for which to add the peanut butter. After the stones are removed you just need to fill them. I find one teaspoon of peanut butter is perfect for one date and I always use a natural peanut butter which contains no added sugar, salt or oil. You can easily replace the peanut butter with a different nut butter or if you are looking for a nut free version you could use tahini. How to choose dates and which ones are best for stuffing. Look for fresh dates that are plump and have a slight glossy look to their skin. They can be wrinkled but shouldn’t be hard. I love using fresh medjool dates as they are plump, sweet, tender and are perfect for stuffing. You usually find them in the produce section as opposed to the dried fruit aisle. 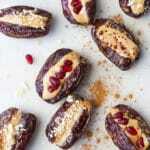 Are stuffed dates good for you? Dates are a healthy source of vitamins, minerals, and fibre. However they are also high in sugar and so should be enjoyed in moderation. I definitely consider this an occasional food but the good things they contain means there are health benefits in consuming dates. 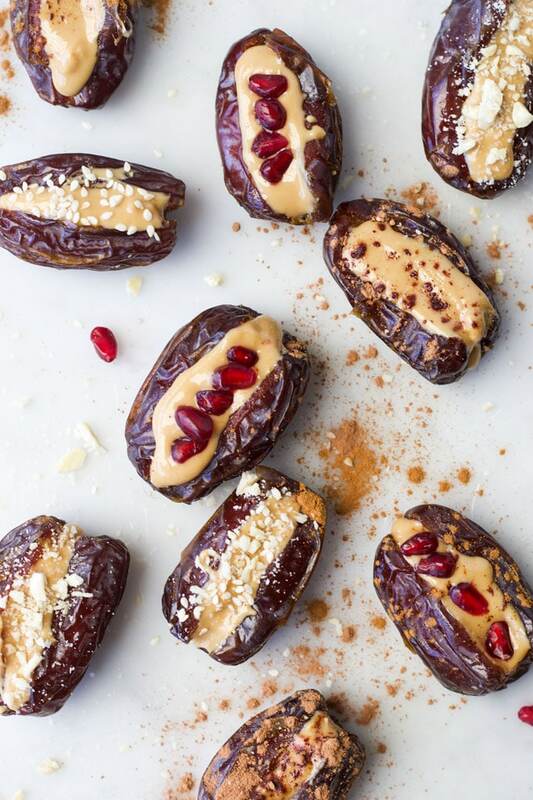 I love to stuff dates with nut butter as it provides some protein. Including protein with a sugar snack, such as fruit, slows the rate at which sugar floods into the bloodstream. If sugar hits your bloodstream quickly you feel high and then very quickly low. The slower it hits your bloodstream the less of a rush you get, but also, less of an after slump. Stuffed dates freeze well; I often make a batch and freeze on a baking tray until frozen. I then transfer to a zip lock bag and take out as needed, I actually love them straight from the freezer but they are best when taken up to room temperature. Have you tried these? I’d love to see a picture! Tag me on Instagram or Facebook. Love dates? Why not try…. Add a tsp of peanut butter to each date. I use a natural peanut butter with no added salt, sugar or oil. You can replace the peanut butter with any nut butter or tahini. You can eat them as they are or add toppings of your choice. 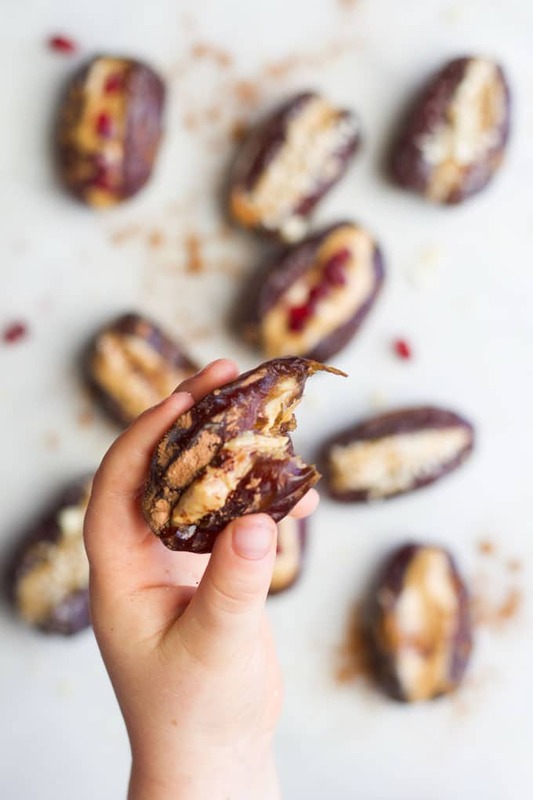 I love them with a sprinkle of cinnamon but you could add cacao powder, crushed nuts, coconut, pomegranate seeds, sesame seeds or drizzled chocolate. Nutritional facts are an ESTIMATE only, calculated using an online calculator. Facts will vary depending on type/size of dates and brand of nut butter used. Facts are bases on one medjool date stuffed with 100% natural peanut butter. It does not include any additional toppings. Wow, these tasted delicious and so easy to make. Yum. I have this snack quite often – love this combo as it is always satisfying!!! So satisfying! Kind of like a natural snickers bars! What a great little snap for my niece. I do believe she would love this because she will try anything. If she is anything like my boys then she will love it! Ooh, these look like the perfect bite-sized snack. And so simple! Love it. Thanks Lisa, I love simple! This looks like a delicious little treat. I love the cute fingers enjoying it. Thanks for sharing. Thanks Chichi, I’m a sucker for the chubby hands. Gutted that my hand models are getting bigger! Thanks Natalie, so do I! A tasty and healthy treat. What a great idea, thanks!